Rocket is a strange beast of a comic. Written by Al Ewing, with art by Adam Gorham, the book is a mixture of neo-noir crime thriller, heist movie, weird science fiction, and, well, comedy. And yet, due to Ewing’s love of comic book history and the impeccable comedic timing of Gorham’s art, it all works. Take, for instance, this joke from issue two. The story is thus: Rocket has gotten captured after he broke into a vault and stole the deed for some land for an ex-girlfriend. Now he is on trial, but not to worry: he has a lawyer. A strangely familiar lawyer. Yes, that’s right: Frogurt “Froggy” Frelson and Murd Blurdock from Everett-5 (named after Bill Everett, co-creator of Daredevil). But that’s not the end of the joke, oh no. 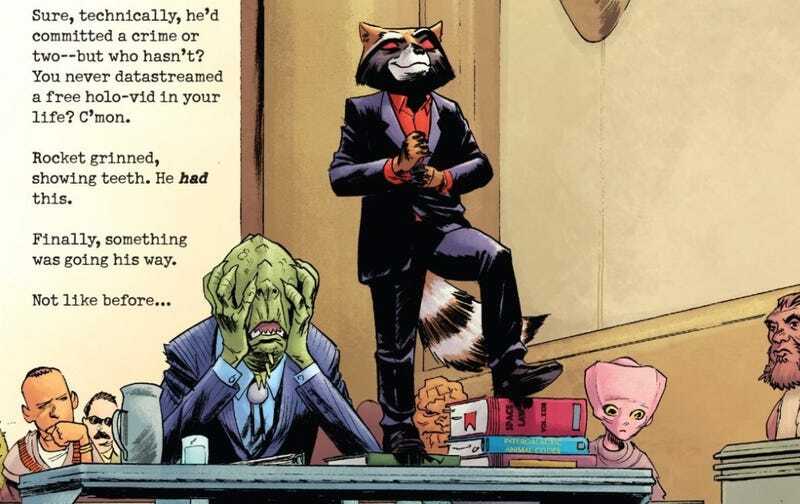 If you aren’t reading Rocket, you are wasting your life.